Amongst the tales I tell you once again, I would not forget the Lay of the Were-Wolf. Such beasts as he are known in every land. Bisclavaret he is named in Brittany; whilst the Norman calls him Garwal. It is a certain thing, and within the knowledge of all, that many a christened man has suffered this change, and ran wild in woods, as a Were-Wolf. The Were-Wolf is a fearsome beast. He lurks within the thick forest, mad and horrible to see. All the evil that he may, he does. He goeth to and fro, about the solitary place, seeking man, in order to devour him. Hearken, now, to the adventure of the Were-Wolf, that I have to tell. In Brittany there dwelt a baron who was marvelously esteemed of all his fellows. He was a stout knight, and a comely (handsome), and a man of office (of high position...had status) and repute (good reputation.) Right private was he to the mind of his lord, and dear to the counsel (advice) of his neighbors This baron was wedded to a very worthy dame, right fair to see, and sweet of semblance. All his love was set on her, and all her love was given again to him. One only grief had this lady. For three whole days in every week her lord was absent from her side. She knew not where he went, nor on what errand. Neither did any of his house know the business which called him forth. On a day when this lord was come again to his house, altogether joyous and content, the lady took him to task (fussed at him), right sweetly, in this fashion, "Husband," said she, "and fair, sweet friend, I have a certain thing to pray of you. Right willingly would I receive this gift, but I fear to anger you in the asking. It is better for me to have an empty hand, than to gain hard words." When the lord heard this matter, he took the lady in his arms, very tenderly, and kissed her. "Wife," he answered, "ask what you will. What would you have, for it is yours already?" "By my faith," said the lady, "soon shall I be whole. Husband, right long and wearisome are the days that you spend away from your home. I rise from my bed in the morning, sick at heart, I know not why. So fearful am I, lest you do aught to your loss, that I may not find any comfort. Very quickly shall I die for reason of my dread. Tell me now, where you go, and on what business! How may the knowledge of one who loves so closely, bring you to harm?" "Wife," made answer the lord, "nothing but evil can come if I tell you this secret. For the mercy of God do not require it of me. If you but knew, you would withdraw yourself from my love, and I should be lost indeed." When the lady heard this, she was persuaded that her baron sought to put her by with jesting (teasing) words. Therefore she prayed and required him the more urgently, with tender looks and speech, till he was overborne (overcome), and told her all the story, hiding naught (nothing). "Wife, I become Bisclavaret. I enter in the forest, and live on prey and roots, within the thickest of the wood." After she had learned his secret, she prayed and entreated (pleaded) the more as to whether he ran in his raiment (clothing), or went spoiled of vesture (clothing: vest= clothes). "Wife," said he, "I go naked as a beast." "Tell me, for hope of grace, what you do with your clothing?" "Fair wife, that will I never. If I should lose my raiment, or even be marked as I quit my vesture, then a Were-Wolf I must go for all the days of my life. Never again should I become man, save in that hour my clothing were given back to me. For this reason never will I show my lair." "Husband," replied the lady to him, "I love you better than all the world. The less cause have you for doubting my faith, or hiding any tittle from me. What savor (pleasure) is here of friendship? How have I made forfeit (a loss) of your love; for what sin do you mistrust my honor? Open now your heart, and tell what is good to be known." So at the end, outwearied and overborne (over taken) by her importunity (excessive demands), he could no longer refrain (resist), but told her all. "Wife," said he, "within this wood, a little from the path, there is a hidden way, and at the end thereof an ancient chapel, where oftentimes I have bewailed my lot (moaned over my circumstances). Near by is a great hollow stone, concealed by a bush, and there is the secret place where I hide my raiment, till I would return to my own home." On hearing this marvel the lady became sanguine of visage (blood red in her appearance), because of her exceeding fear. She dared no longer to lie at his side, and turned over in her mind, this way and that, how best she could get her from him. Now there was a certain knight of those parts, who, for a great while, had sought and required this lady for her love. This knight had spent long years in her service, but little enough had he got thereby, not even fair words, or a promise. To him the dame wrote a letter, and meeting, made her purpose plain. "Fair friend," said she, "be happy. That which you have coveted so long a time, I will grant without delay. Never again will I deny your suit (courtship). My heart, and all I have to give, are yours, so take me now as love and dame." Right sweetly the knight thanked her for her grace, and pledged her faith and fealty (loyalty). When she had confirmed him by an oath, then she told him all this business of her lord--why he went, and what he became, and of his ravening (greedy feeding) within the wood. So she showed him of the chapel, and of the hollow stone, and of how to spoil the Were-Wolf of his vesture. Thus, by the kiss of his wife, was Bisclavaret betrayed. Often enough had he ravished his prey in desolate places, but from this journey he never returned. His kinsfolk and acquaintance came together to ask of his tidings (a piece of news), when this absence was noised abroad. Many a man, on many a day, searched the woodland, but none might find him, nor learn where Bisclavaret was gone. The lady was wedded to the knight who had cherished her for so long a space. More than a year had passed since Bisclavaret disappeared. Then it chanced that the King would hunt in that self-same wood where the Were-Wolf lurked (to move or lie in a hidden manner). When the hounds were unleashed they ran this way and that, and swiftly came upon his scent. At the view the huntsman winded on his horn, and the whole pack were at his heels. They followed him from morn to eve, till he was torn and bleeding, and was all adread lest they should pull him down. Now the King was very close to the quarry (prey), and when Bisclavaret looked upon his master, he ran to him for pity and for grace. He took the stirrup within his paws, and fawned upon the prince's foot. The King was very fearful at this sight, but presently he called his courtiers (members of the king's court) to his aid. "Lords," cried he, "hasten hither (move quickly here), and see this marvelous thing. Here is a beast who has the sense of man. He abases (to make oneself low) himself before his foe (enemy/opponent), and cries for mercy, although he cannot speak. Beat off the hounds, and let no man do him harm. We will hunt no more to-day, but return to our own place, with the wonderful quarry we have taken." The King turned him about, and rode to his hall, Bisclavaret following at his side. Very near to his master the Were-Wolf went, like any dog, and had no care to seek again the wood. When the King had brought him safely to his own castle, he rejoiced greatly, for the beast was fair and strong, no mightier had any man seen. Much pride had the King in his marvelous beast. He held him so dear, that he bade (gave orders) all those who wished for his love, to cross the Wolf in naught (if you love me the king, do not do anything to harm the werewolf), neither to strike him with a rod, but ever to see that he was richly fed and kenneled warm. This commandment the Court observed willingly. So all the day the Wolf sported (had fun) with the lords, and at night he lay within the chamber (bedroom) of the King. There was not a man who did not make much of the beast, so frank was he and debonair (gentle and mannerly). None had reason to do him wrong, for ever was he about his master, and for his part did evil to none. Every day were these two companions together, and all perceived that the King loved him as his friend. Hearken now to that which chanced. The King held a high Court, and bade (past tense of bid- to order) his great vassals (one subservient to a lord) and barons, and all the lords of his venery (a hunt-- think venison) to the feast. Never was there a goodlier feast, nor one set forth with sweeter show and pomp (extravagance). Amongst those who were bidden, came that same knight who had the wife of Bisclavaret for dame (wife). He came to the castle, richly gowned, with a fair company, but little he deemed whom he would find so near. Bisclavaret marked his foe the moment he stood within the hall. He ran towards him, and seized him with his fangs, in the King's very presence, and to the view of all. Doubtless he would have done him much mischief, had not the King called and chidden (past tense of chide- to voice disapproval) him, and threatened him with a rod. Once, and twice, again, the Wolf set upon the knight in the very light of day. All men marvelled at his malice (mal=bad... bad intent), for sweet and serviceable was the beast, and to that hour had shown hatred of none. With one consent the household deemed that this deed was done with full reason, and that the Wolf had suffered at the knight's hand some bitter wrong. Right wary (worried) of his foe was the knight until the feast had ended, and all the barons had taken farewell of their lord, and departed, each to his own house. With these, amongst the very first, went that lord whom Bisclavaret so fiercely had assailed (attacked). Small was the wonder that he was glad to go. No long while after this adventure it came to pass that the courteous King would hunt in that forest where Bisclavaret was found. With the prince came his wolf, and a fair company. Now at nightfall the King abode (lodged) within a certain lodge of that country, and this was known of that dame who before was the wife of Bisclavaret. In the morning the lady clothed her in her most dainty apparel, and hastened to the lodge, since she desired to speak with the King, and to offer him a rich present. When the lady entered in the chamber, neither man nor leash might restrain the fury of the Wolf. He became as a mad dog in his hatred and malice. Breaking from his bonds he sprang at the lady's face, and bit the nose from her visage. From every side men ran to the succor (aid) of the dame. 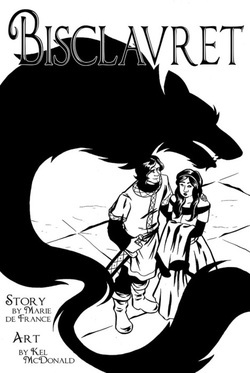 They beat off the wolf from his prey, and for a little would have cut him in pieces with their swords. But a certain wise counselor (adviser) said to the King, "Sire, hearken now to me. This beast is always with you, and there is not one of us all who has not known him for long. He goes in and out amongst us, nor has molested any man, neither done wrong or felony to any, save only to this dame, one only time as we have seen. He has done evil to this lady, and to that knight, who is now the husband of the dame. Sire, she was once the wife of that lord who was so close and private to your heart, but who went, and none might find where he had gone. Now, therefore, put the dame in a sure place, and question her straightly, so that she may tell--if perchance she knows thereof--for what reason this Beast holds her in such mortal hate. For many a strange deed has chanced, as well we know, in this marvelous land of Brittany." The King listened to these words, and deemed the counsel good. He laid hands upon the knight, and put the dame in surety in another place. He caused them to be questioned right straightly, so that their torment was very grievous. At the end, partly because of her distress, and partly by reason of her exceeding fear, the lady's lips were loosed, and she told her tale. She showed them of the betrayal of her lord, and how his raiment was stolen from the hollow stone. Since then she knew not where he went, nor what had befallen him, for he had never come again to his own land. Only, in her heart, well she deemed and was persuaded, that Bisclavaret was he. Straightway the King demanded the vesture (Bisclavaret's stolen clothes) of his baron, whether this were to the wish of the lady, or whether it were against her wish. When the raiment was brought him, he caused it to be spread before Bisclavaret, but the Wolf made as though he had not seen. Then that cunning and crafty counselor took the King apart, that he might give him a fresh rede (advice). "Sire," said he, "you do not wisely, nor well, to set this raiment before Bisclavaret, in the sight of all. In shame and much tribulation must he lay aside the beast, and again become man. Carry your wolf within your most secret chamber, and put his vestment therein. Then close the door upon him, and leave him alone for a space. So we shall see presently whether the ravening beast may indeed return to human shape." The King carried the Wolf to his chamber, and shut the doors upon him fast. He delayed for a brief while, and taking two lords of his fellowship with him, came again to the room. Entering therein, all three, softly together, they found the knight sleeping in the King's bed, like a little child. The King ran swiftly to the bed and taking his friend in his arms, embraced and kissed him fondly, above a hundred times. When man's speech returned once more, he told him of his adventure. Then the King restored to his friend the fief (a feudal estate, property given by a lord) that was stolen from him, and gave such rich gifts, moreover, as I cannot tell. As for the wife who had betrayed Bisclavaret, he bade her avoid his country, and chased her from the realm. So she went forth, she and her second lord together, to seek a more abiding city, and were no more seen. The adventure that you have heard is no vain (foolish) fable. Verily and indeed it chanced as I have said. The Lay of the Were-Wolf, truly, was written that it should ever be borne in mind. 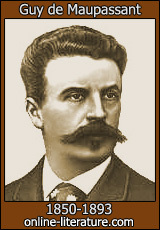 STORY # 1: "Two Friends" or in French "Deux Amis"
"Deux Amis" or "Two Friends" by French author Guy de Maupassant, is set in Paris during the Franco-Prussian War, when the city lay under siege. The story examines French bravery, German stereotypes, and unusually for Maupassant, discusses the nature and justification of war in the form of a conversation between the two protagonists. The story closes in Paris in January 1871, at the height of the siege, and introduces the main character, Monsieur Morissot, a watchmaker who has enrolled in the National Guard. Morissot, who is bored, hungry, and depressed, is walking along the boulevard when by chance he bumps into an old friend, Monsieur Sauvage, with whom he used to go fishing before the war. The two old friends reminisce over several glasses of absinthe (a dessert drink) in a café, talking wistfully of the pleasant Sunday afternoons they used to spend fishing on the banks of the Seine before the war. Tipsy from the absinthe, the friends, for want of anything else to do, decide to go fishing in their old spot, and having obtained a laissez-passer from their officer, walk along the river to Argenteuil, a few miles west of the city, in the no man's land between the French and Prussian lines. 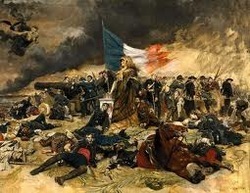 The two start fishing and when they see the nearby fortress of Mont-Valérien firing at the Prussians, they start discussing the war, which turns into a friendly debate at the end of which they both agree that the war is a tragedy for both France and Prussia, and that as long as there are governments, there will be wars.